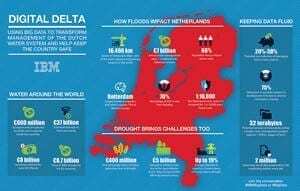 IBM has announced the launch of Digital Delta, a breakthrough innovation program that will harness insights from Big Data to transform flood control and the management of the entire Dutch water system. The program is in collaboration with Rijkswaterstaat (the Dutch Ministry for Water), local Water Authority Delfland, Deltares Science Institute and the University of Delft. Digital Delta will investigate how to integrate and analyze water data from a wide range of existing data sources. These include precipitation measurements, water level and water quality monitors, levee sensors, radar data, model predictions as well current and historic maintenance data from sluices, pumping stations, locks and dams. At Digital Delta’s core is an intelligent, cloud-based system built on IBM’s Intelligent Water software and Smarter Water Resource Management solution including consulting expertise. With 55 percent of the Dutch population located in areas prone to large-scale flooding, the Netherlands has immense experience in preventing floods and managing water. Every water-related event is critical and can impact businesses, agriculture and citizens’ daily lives. The ongoing cost of managing water, including anticipating flooding, droughts and low water levels, adds up to €7 billion each year. These costs are expected to increase €1- 2 billion by 2020, unless urgent action is taken. The new management system will address concerns ranging from the quality of drinking water to the increasing frequency and impact of extreme weather-related events to the risk not only of floods but also droughts. By modeling weather events, the Netherlands will be able to determine the best course of action including storing water, diverting it from low-lying areas, avoiding saltwater intrusion into drinking water, sewage overflows and water contamination. The Netherlands has one of the best-monitored water systems in the world. While large amounts of data are collected, relevant data can be difficult to find, data quality can be uncertain and with data in many different formats, this creates costly integration issues for water managing authorities. Solving these Big Data challenges is an important step towards a Smarter Water management approach. The initiative will provide water experts with a real-time intelligent dashboard to harness information so it can be shared immediately across organizations and agencies. Using data visualization and deep analytics, these insights can help prepare for imminent difficulties, enabling authorities to coordinate and manage response efforts and, over the longer term, to enhance the ongoing efficiency of overall water management. With better integrated information, water authorities will be able to prevent disasters and environmental degradation, while reducing the cost of managing water by up to 15 percent.